The purpose of this study was to compare relative values of manual unidimensional measurements (MD) and automated volumetry (AV) for longitudinal treatment response assessment in patients with pulmonary metastases. 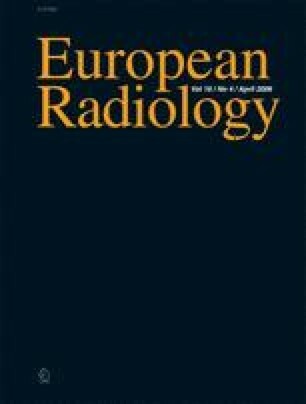 Fifty consecutive patients with pulmonary metastases and repeat chest multidetector-row CT (median interval=2 months) were independently assessed by two radiologists for treatment response using Response Evaluation Criteria In Solid Tumours (RECIST). Statistics included relative measurement errors (RME), intra-/interobserver correlations, limits of agreement (95% LoA), and kappa. A total of 202 metastases (median volume=182.22 mm3; range=3.16–5,195.13 mm3) were evaluated. RMEs were significantly higher for MD than for AV (intraobserver RME=2.34–3.73% and 0.15–0.22% for MD and AV respectively; P<0.05. Interobserver RME=3.53–3.76% and 0.22–0.29% for MD and AV respectively; P<0.05). Overall correlation was significantly better for AV than for MD (P<0.05). Intraobserver 95% LoAs were −1.85 to 1.75 mm for MD and −11.28 to 9.84 mm3 for AV. The interobserver 95% LoA were −1.46 to 1.92 mm for MD and −11.17 to 9.33 mm3 for AV. There was total intra-/interobserver agreement on response using AV (κ=1). MD intra- and interobserver agreements were 0.73–0.84 and 0.77–0.80 respectively. Of the 200 MD response ratings, 28 (14/50 patients) were discordant. Agreement using MD dropped significantly from total remission to progressive disease (P<0.05). We therefore conclude that AV allows for better reproducibility of response evaluation in pulmonary metastases and should be preferred to MD in these patients. We would like to thank Professor John Martin Bland from the Department of Health Sciences, University of York, UK, for invaluable advice on the statistical analysis.